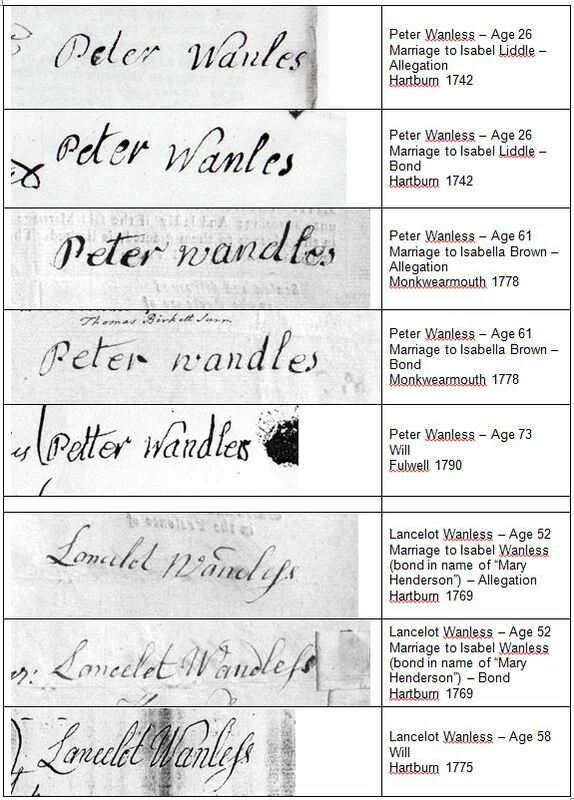 This certainly looks like the same person signed both documents, and would seem to establish a link between the family of Peter Wandlass. Tony Palmer also has a photocopy of the marriage of Thomas Wandlass & Elizabeth Bell at Boldon 21 Dec 1800 and Thomas’s signature matches that on the will of 1807, and Elizabeth’s (i.e. the Eliz. bit) matches that of Eliz. Wandlass on the will of Elizabeth Wandlass in 1820. Note the similarities between Ann and William’s (above) signatures – the small loop at the beginning of the W.
Margaret Wanless & Samuel Baird marriage, 1825, Longbenton. Margaret’s “W” looks a lot like Ann’s “W” above, but John’s “W” doesn’t share the same small loop at the beginning. We don’t know if John is Margaret’s father, brother, or another relative.